This entry was posted on September 25, 2013 at 10:23 pm and is filed under Fantasy, Ray Cluley, Science Fiction, Short Story. You can follow any responses to this entry through the RSS 2.0 feed. You can skip to the end and leave a response. Pinging is currently not allowed. Thank you so much for this everyone, I’m blown away by what you’ve done. Absolutely astounding work – I’m so lucky. CONGRATULATIONS on your Parsec Award, very well earned several times over the years. 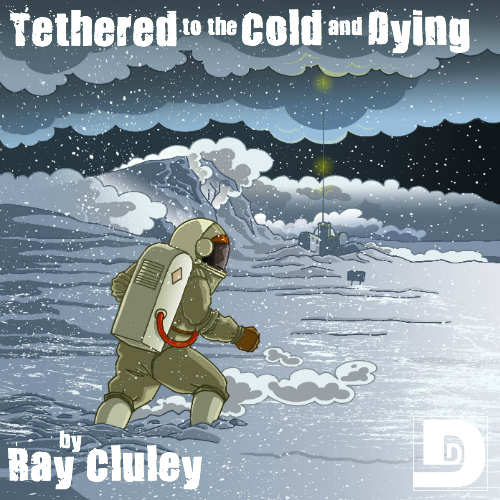 Tethered to the Cold an Dying Was an amazing recording, great reading with awesome sound effects. I don’t usually enjoy scifi but this story was great, and I did clue into the Jack in the Beanstock clues. But what in the sam hills is this Dunesteef pronounced Donesteef about? Typical of you guys, you are always doing something to keep me listening, love your sense of humour! Great story, great reading, but I have to wonder if the author has ever met a flock of geese. Leaving them loose in an enclosed area… cleanup would be an ongoing nontrivial problem.